Seriously, you can't help but save money on food and groceries when you use this thing! Buying a new gadget or small appliance for my kitchen is not a decision I take lightly. I try to avoid unnecessary clutter in my kitchen as much as possible, so I’m really selective about buying things that will take up counter space. That being said, I believe that sacrificing a bit of space to my vacuum sealer was one of the best decisions I’ve made in years! Many people tend to view vacuum sealers as unnecessary luxuries, or as only being useful for preppers or people with big families. But everyone can benefit from owning a vacuum sealer, and today I’ll tell you exactly how! Whether you’re cooking for two people or ten, using a vacuum sealer to store food will help you stock up, cut back on waste, and save money almost effortlessly. Using a vacuum sealer, you can kiss freezer burn goodbye! The lifespan of frozen foods stored in a vacuum-sealed bag is MUCH longer than foods stored in a normal freezer bag. For instance, frozen beef will stay fresh for about 6 months when stored in a freezer bag. But if you use a vacuum sealer to store it, frozen beef can last around 2 or 3 YEARS! When you take freezer burn out of the equation, your frozen foods won’t go to waste. And less waste equals less wasted money! With a vacuum sealer, you can take advantage of sale prices on foods like meat and cheese by buying them in bulk. Freeze whatever you won’t use immediately in vacuum-sealed bags. They’ll stay fresh for months and months and save you a lot of money over time! You can use a vacuum sealer to keep herbs fresh for months! Quickly blanch the herbs in boiling water—about one minute should do—then dunk them into ice water. Dry the herbs off, then vacuum seal and freeze them. Buy fresh herbs in the summer when they’re cheap, and use them up throughout the winter! Grocery stores usually offer the lowest prices when a particular food is most readily available. Take advantage of any seasonal items by buying in bulk when the price is low. Use your vacuum sealer to seal them up and store them in your freezer. You can enjoy cheaper, tastier produce all year long! Leftovers typically only stay fresh in the fridge for a day or two. You can keep them fresh for up to a week just by storing them in vacuum-sealed bags! No more throwing out leftovers you forgot to eat. Dry goods already have a pretty long lifespan, but vacuum-sealing them can help them last even longer! Store flour, sugar, rice, dry beans, nuts, oats, and more in vacuum-sealed bags. This is really useful for long-term food storage. Vacuum-sealed bags are more compact than traditional storage bags and containers. When each item is compact, you can fit more of them in your fridge, freezer, and pantry. When you have more space, you have more space to store bulk products and save even more money! 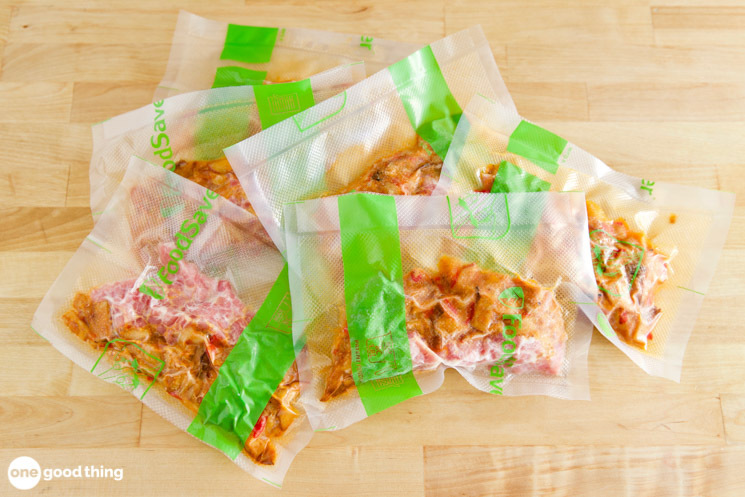 You can use a vacuum sealer to store easy meals in your fridge or freezer. If you have something on hand you can make quickly, you’ll be less likely to spend money on a last-minute fast food run. You can portion out and seal smoothie ingredients for breakfast, or freezer meals for dinner! Honestly, it’s almost impossible to not save money when you start using a vacuum sealer to store food. And while they’re simple machines to use, there are a few tips and tricks that are definitely worth learning. Here are 5 useful tips that will help you make the most of your vacuum sealer! Freeze First – If something is likely to be crushed by the pressure of a vacuum sealer, freeze it first! If you freeze delicate or wet items like bread, berries, and sauces first, they won’t get crushed or squished when you seal them up. Boxed.com — Wholesale Club Shopping Without Leaving Home! Stop Halfway Through – Another method for sealing up wet or delicate items is to stop the vacuuming process before it finishes. Just press the Vac/Seal button, then press Seal before the item gets squished or liquid starts leaking out. It will immediately stop the vacuuming process and seal the bag up. Label Everything – Keep a marker near your vacuum sealer so you can label all your bags. Make sure to note what the food is and when you sealed it. This will help you identify what should get used up first when you get around to eating it. Use The Same Bag – You can get vacuum sealer bags in roll form, which makes it easy to make bags as long or short as you want. If you want to be able to use a little bit of a certain food at a time, store it in an extra-long bag. You can cut it open, get some of the food out, then reseal it again and again. It’s much less wasteful than using a new bag every time! Help For Sensitive Earring Wearers – Like Me! Does the FoodSaver work with raw greens and veggies (non-blanched)? I am part of CSA and sometimes get stuck not being about to eat all the veggies in a week’s time. I love fresh farm produce but the spring and summer can bring a overload of greens! Absolutely! Blanching helps with the texture, but raw veggies can be vacuum sealed too :-) Just be careful not squish greens, they’ll become a clump if you vacuum seal all of the air out. Bought the Nutrisave sealer …almost identical to this one you are touting and it worked once super good and now done for. Back to using the bulky FoodSaver one we had. Out $56 as past the return/warranty time. The one you are touting has less stars than the other I choose…guess it is all about luck and getting a good machine to start with.. These are great tips – thanks Landon! Food saver brand bags are expensive, look on amazon for “off” brand sealer bags! I order from a company called lemon tree, the bags are exactly the same quality at less than half the price!! Great tip, thanks! I’ve been buying Ziplock or other brands that are labeled as working with any vacuum sealer. I’ll have to compare & see if Lemon Tree will save me more on bags. I have used the food saver for years for all of the items and more that Jillee mentioned in her blog. My hubby will tell you it is the most used gadget in our home. Well worth the investment! I bought a food saver over a year ago and I just love it. I use it all the time. It has a permanent spot on my counter. One of the first things I do after getting my coffee in the morning is check on What Are The WORDS OF WISDOM that Jillee has to offer. I have many gadgets that just wait for a particular reason to use them. Your articles make me take them out and put them to better use. Thank you. Wow, thank you so much Joan!